The Kinabalu Supertracs are incredibly comfortable, with a wide toe box, lots of cushioning and good protection all the way around the upper. Although they don’t score well for lightness or precision, they really look after your feet, however savage the terrain, and even feel good for stretches of road. With 6mm chevron-shaped lugs across the entire sole, grip is outstanding on all surfaces. The closely spaced tread pattern doesn’t clear heavy mud as well as some on test and they don’t drain particularly fast. An 8mm drop combined with the weight and bulk of these shoes means they do feel a little sluggish at times. Verdict: A beefy shoe with good grip, comfort and protection. a debris gaiter. The Vibram outsole has a ‘mapped’ 7mm tread, providing lateral stability at the forefoot, superb grip on the midfoot and increased durability and friction on toe and heel. The adaptive grid on the sides gives a great balance between support and flexibility. Verdict: Clever design gives impressive looks and performance. This is a shoe of two halves. The super-grippy outsole covered with rugged 8mm lugs is tough and protective. Above this are big wedge of cushioning and a stretchy, lightweight Flexfilm upper with a roomy toebox. Unfortunately, the result feels wallowy and unresponsive as the lack of structure in the upper struggles to hold the foot on the relatively inflexible sole. They are comfortable enough on gentle terrain – almost like a nice pair of slippers, in fact – but the lack of support in the upper coupled with the aggressiveness of the tread means that they don’t perform as well as they should on technical ground. 4mm drop. Verdict: Roomy, but poor precision due to aggressive tread. Designed to grip on all surfaces these are a great choice if you’re after a shoe that will keep you on your feet all winter. Haglöfs incorporate an Asics-designed spike system with a self-clearing tread pattern. The 6mm lugs are set with 16 metal spikes for superb traction even on ice and snow. The protective Gore-Tex-lined upper keeps your feet warm and dry, and there’s enough cushioning through the Gel rearfoot and Solyte midfoot to ensure running on hard-packed surfaces is smooth and comfortable. Smart style and a reflective stripe on the heel complete this great shoe for winter trails. 10mm drop. Verdict: Warm, waterproof and spiked: a winter specialist. The Mudclaw’s 8mm lugs give the best grip in mud of any shoe we’ve ever tested. A winning combo of a super-aggressive tread pattern, dual-density rubber and pyramid-shaped studs that shed mud quickly so they don’t get clogged up. They grip well on steep grassy slopes and rocky ground, although a rock plate might increase comfort here. They are lightweight with a 6mm drop and a narrow precision fit giving them a responsive, low-to-the-ground feel. The upper has a protective rand and toe bumper which adds a good amount of protection when running on rough ground. Verdict: A brilliant fell shoe with incredible grip in muddy conditions. The Mutant is a supportive and protective shoe designed for the demands of mountain running. The Spyraltongue system hugs your foot beautifully creating an excellent fit, and also act as a debris gaiter. It’s a wide fit for this brand but still has a narrow toe for precision (bear in mind that La Sportiva also size fairly small). Underfoot a 10mm drop combines with a thick EVA midsole to create a comfortable ride on the rockiest terrain. The Frixion XF rubber sole with 6mm deep tread grips well on grass and copes well with a bit of mud too. It’s brilliant on dry rock and gravel but can lose traction in the wet. Verdict: Protective and comfortable. Good for long distances. 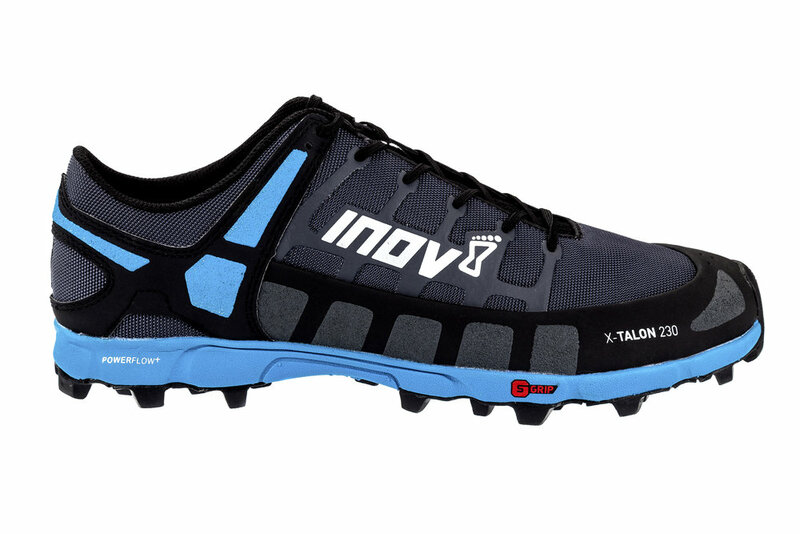 The new X-Talon 230 utilises Inov-8’s new Stickygrip rubber compound for superb traction on all surfaces. Whether you’re on wet rock, greasy Tarmac, grass or mud these really do stay put. Powerful 8mm lugs grip brilliantly on the softest ground and a flexible rock plate adds great protection underfoot for stony trails. There’s a little more cushioning than on the previous model and the upper is made from non-absorbent fabric meaning they don’t soak up water, and stay light and comfortable. The fit is slim and precise with a nice deep heel cup. A great update on a great shoe, adding extras without losing the best bits. Verdict: A super-grippy all-terrain classic that just got even better. The Speedcross is another established off-road favourite. This 4th edition feels more precise than some of the previous models but still retains that plush, all-round cushioned feel that makes them great for long-distance training and racing. The 7mm chevron-shaped lugs and Contragrip sole give outstanding grip on mud, grass, technical trails and all dry surfaces. Where they come unstuck is on wet rocks, roads and pavements, and they don’t drain as quickly as some. The upper is water- and debris-resistant which keeps feet warm and dry, and the Quicklace system keeps everything locked in place. 10mm drop. Verdict: Comfortable, protective and generally grippy. The Speedspike is designed for technical trail running in winter conditions. Salomon has started with an aggressive Contragrip sole and added 15 carbide spikes. The result is a shoe that grips well on grass, mud and gravel but excels on ice; it’s good on rock but leaves scratches and will presumably wear out fairly quickly if used on harder surfaces. The sole is moderately cushioned with a 6mm drop and a nice, stable feel. The fit is very similar to the Speedtrack and wider than the Speedcross. The upper features quick lacing, padded tongue and debris gaiter with Climashield for added warmth and protection in winter conditions. Verdict: Great to run in but on the heavy side and winter-specific. This is Swedish company Salming’s ‘no nonsense’ off-trail shoe. It’s lightweight, has a 4mm drop, a light protective rand and a thin but cushioned midsole. The outsole features a widely-spaced pattern of 7mm directional lugs which grip very well on grass, mud and rock; they clear mud well but aren’t quite as grippy as the Mudclaw when contouring the Great British muddy hillside. The upper has a two-layer construction with a tough outer mesh over a soft inner sock; it’s a light and comfortable solution that works well in action. The toebox is generous compared with others on test, so they’d be well suited to the longer distances as well. Verdict: A light and technical super-grippy shoe with a wider fit. The second edition of the IRock from Finnish orienteering company VJ Sports is a lightweight and technical shoe designed for racing. The butyl rubber sole features an aggressive pattern of 7mm studs under the forefoot and 8mm studs under the heel; it grips well on all surfaces and is a favourite of obstacle racing world champion Jonathon Albon. The 6mm drop and slim yet cushioned midsole combines with a narrower last to produce an extremely precise shoe, perfect for running fast over technical terrain. The Kevlar upper combines light weight and flexibility with great durability. Despite the narrower fit they’re comfortable to wear with good support and Fitlock lacing. 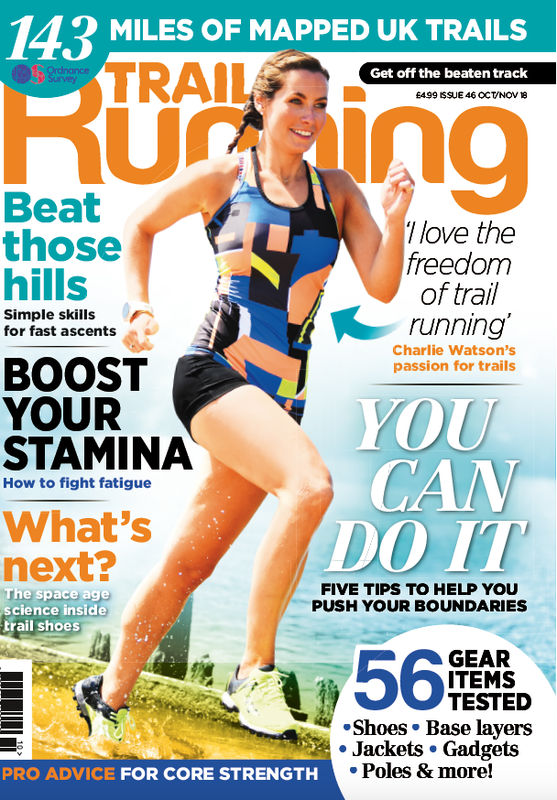 Verdict: An excellent technical racer, perfect for agile runners. 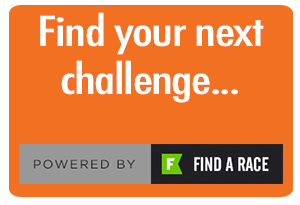 This is a zero-drop mountain running shoe with a grippy tread. Altra’s trademark wide toebox is designed to allow the toes to spread, resulting in a shoe that’s comfortable but imprecise. In this model the foot-lock strap over the forefoot prevents the foot moving too much within the shoe; they are definitely the most stable Altras we’ve tested. The ripstop polyester upper feels tough and comfortable, while underfoot the lightly cushioned midsole combines with a rock plate to protect your feet from the trail. The Vibram outsole with 5mm deep chevron shaped lugs grips well for running directly up or downhill on mud or grass but loses traction on corners and contouring. Verdict: Zero drop, generous fit and good grip; not for technical terrain.